When Tommy couldn’t find any fault with either the history in my commentary, or my description of the proposed copper nickel mining which was clearly spelled out in the second part of my article, he needed a diversion to take the focus off the ugly reality of copper nickel mining. According to Representative Rukavina, the reason why things aren’t so good on the Mesabi Range is that they spend so much money trying to bolster the feeble tourist based economy in places like Ely, Tower, and Grand Marais. Listening to Rukavina rant, all of us poor cousins living north and east of the Mesabi Range are a veritable welfare state, and the only thing that keeps us alive is the charity of the good people of the Mesabi Range. What Tommy Rukavina doesn’t want to admit is that when the State of Minnesota created the IRRB seventy years ago its mission was to help the economy of the Arrowhead Country which includes almost all of Cook, Lake, and St. Louis Counties. The money that funds the IRRB doesn’t come from the people of Virginia, Eveleth, Chisholm, Hibbing, or any other Mesabi Range city, the money comes from a tax the steel companies pay to benefit all the people within the range of the state’s mandate. If you don’t like the rules which govern the IRRB Tommy you best stop complaining and take the matter up with the state legislature. I don’t know what people think of you on the Mesabi Range, Tommy, but north of the divide some of my Ojibway friends refer to you as, Kijikawin-Kiniw, The Slow Walking War Eagle, because you’re so full of rubbish that you can’t possibly fly. At one point you call yourself a Marxist railing against corporate America. 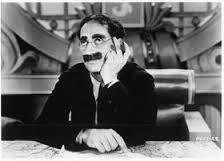 It made me wonder Tommy, which one of the Marx Brothers you like best? You demean people who don’t agree with you by saying that you will write real slow so you won’t confuse us: Don’t worry Representative Rukavina you’re plenty slow enough just as you are. In order to try to score a point you state that if we can go to the moon, we should be able to safely mine copper and nickel in Minnesota, but after six years and thirty million dollars of trying these multinational mining companies still can’t meet the state’s standards. I’m surprised that you haven’t suggested we lower the standards to help your foreign friends that help fund your re-election campaign. With a forty ton ratio of wasted sludge for one ton of copper or nickel harvested, maybe the truth is that we will never be able to mine sulfide bearing rock without wasting the land and poisoning the water. I don’t know about William or Robert, Tommy, but I don’t own an automobile or a cell phone. My lap top computer is so old my computer technician tells me my computer’s operating system is so out of date, that when they upgrade next year, my lap top won’t be able to run the new soft ware mandated by the company, and I will be forced to buy a new unit. The electricity in my home was installed in 1938, and I see no point in uninstalling it. The plumbing in my family home was done the same time as the electricity. I checked about having an outhouse dug in the back yard, but they are illegal within the city limits. About the only real luxury I have are two toilets, and yes, Tommy, they do flush, but I only use one at a time. If that makes me a hypocrite by your standards you have a right to your opinion, which is more than you seem willing to grant to people who think differently than you. I’ve read all your blogs on this issue and I just want to say how fortunate the residents are to have you fighting for them. We need more like you for sure. I’m a tourist to the Ely area and I have to say I wish I could close my eyes every time I travel through Virginia and Eveleth. There’s no need to park on a lookout to see the utter devastation left by previous mining companies. I see plenty just driving through these towns. This is also the reason I keep traveling north until I get to Ely. Beautiful scenery, pristine lakes, and the sounds of nature. That’s what I’m looking for when I vacation and not some polluted dumping ground of toxic waste. I think you should change your moniker to “Iron Man” Mike Hillman. Your solid and unwavering in your fight and that’s what this fight needs.